Intimidation Clothing President & CEO Luke Jernigan joins WNIO 1390 SportsAnimal – FOX Sports Radio’s affiliate in Youngstown, Ohio. Jernigan joins host Ryan McGehee during the 6-8 p.m. program to discuss the latest happenings in the world of Mixed Martial Arts including a look ahead at Saturday’s UFC on FOX and upcoming Bellator MMA events. In addition Jernigan will take a look at the local MMA scene for fans in Northeast Ohio and Western Pennsylvania and update the listening audience on local fan-favorites Brian Rogers, Jessica Eye, Mark Cherico and more. A free online stream of the program will be available on the station’s Web site SportsRadio1390.com. 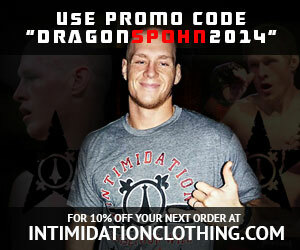 In addition, Intimidation ads will be prevalent on Saturday night’s UFC on FOX radio broadcast on the station.